The DyNA Evo is the latest iteration of Dynafit's racing boot that started turning heads in 2009 and quickly set the standard by which other skimo boots are measured. Using the same basic one-motion buckle / lock system that propelled it to fame, the latest Evo has seen improvements to both its features and weight. It retains the same impressive skiability so you won't be afraid to gun it into the finish line. Changes for 2014/15 include a new liner, sole, and higher spoiler. New Custom Light liners (119g) wrap your foot more evenly and have flex zones to reduce friction while striding. Ultra-Lock system lets you transition quickly by using one motion to buckle-up and ski or unbuckle and walk / run. Carbon fiber cuff with a Pebax front cover is designed to absorb shocks and allow easy entry and exit. The Driving Spoiler 2.0 (red plastic below the cuff) stiffens the boot while skiing and helps prevent heel slippage while walking. The forward lean is now adjustable between 15° and 18° by flipping a metal insert with just a screwdriver. Quick-Step binding inserts have a well-placed notch to guide your boot into any Dynafit-compatible tech binding, reducing transition times. Ultralight Grilamid® shell is molded with a new injection process that allows for incredibly thin walls while retaining stiffness. Buckle catches use velcro which makes for easy fine tuning of cuff and cable tension. Notes Exposed liner above cuff skirt & thin shell can make for cold feet when not racing. Bottom Line No-compromises race boot. What cord would you use for back up for the upper buckle in case of a fray or snap? Hey Aaron! A little loop of accessory cord would do just fine until you could get it fixed. If you're out in the field and something broke then a ski strap will do the trick so you can get back to the trailhead. The early-warning signs are very clear: every several outings or so, check for any fraying, and replace as necessary. Plus a sufficient amount of accessory cord for a full permanent repair in the field is nearly weightless in your pack. Hi Aaron, looks like 3mm should do the trick for replacement. I’m looking for these boots in my size but can’t find them anywhere. I have a US size 14 shoe. Can you help me or reccomend an alternative boot? Hi Chris, unfortunately you're past the size range of race boots. Most folks with your size feet end up in the Sportiva Spitfire size 31 or 31.5. We're expecting those later this fall. Hi Jim, these are high-end skimo racing boots, quite the opposite end of the spectrum than the Lange 140s! You might actually get a good fit in them if you were interested in racing though. I come to the EVO after two full seasons on the Scarpa Alien. 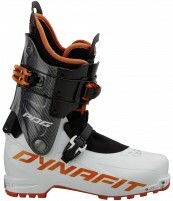 I have skied the EVOs exclusively with the Dynafit PDG skis this season. - The EVO skis much, much better than the Alien. I'm shocked by how well a boot this light skis. I'm stoked to get them on fatter skis (Cho Oyu) this spring. - The EVO's ankle articulation is (somehow) way, way better. Way more like a "tennis shoe" than the Aliens. - While the lower velcro buckle on the EVOs is fine, the BOA on the Aliens is superior, it just gets the lower part of the boot more snug. - For expediency (racing), the throw lever on the Alien is always reliable -- flip it down, it locks every time. The EVOs, on the other hand, lock about 50 percent of the time when thrown, the other 50 percent I have to push on it and wiggle my ankle for it to lock. This is really the only downside of this boot, but, when you're not racing, it's not a big deal. Overall: While I really like the design of the Alien better, I'm happier with the EVO, it just skis and walks that much better. I've used these for two seasons, with a rando race ski and with the Cho Oyu. I have the white version, 2013-2014 I believe. I previously had the TLT5 carbon cuff boot. I use them for speed touring and some mountaineering. The EVO is incredibly light; the walk mode is frictionless, and the sole shape makes walking (or jogging) feel as natural as wearing a hiking shoe. The buckle and mode lever system works well and makes for quick transitions, although I find it fiddly to adjust the cord length on the buckles just right for optimum tension. I didn't have the fragile outsole issues that some reported; for instance, yesterday I walked about four miles off-snow with no signs of significant wear. Comfort is much improved over the TLT5 - the EVO seems to have a slightly wider last in the forefoot and didn't pinch my toes or compress my inner ankle bones like the TLT5 did. But the fit is still secure with good heel hold. I can wear them all day with no issues, although I do notice some pressure on my instep over time, from the buckle there. Although the liner is very thin, my feet have never been cold in these boots (granted I live in California). I attribute this to ample room in the toe box, partly due to the thin liner and partly to the more generous shell shape. The boot has plenty of lateral and rearward stiffness and, on consistent snow, skis really well even with a wider ski like the Cho Oyo. Powder, corn, hard snow--it's all good as long as it's consistent. Steepness is not an issue; the skis have plenty of lateral stiffness for great edge hold. Con: Although the carbon cuff is very stiff, there is a lot of forward flex due to the lower boot shell flexing. For me, it's enough that skiing these in variable snow is difficult and not too much fun. The flex allows me to get pitched forward, which then means there's a lot of room to get pitched backward...making balance and control difficult. I'm 6'2" so I suspect my experience may be very different from shorter skiers who don't apply as much leverage to the boot. I still give it five stars because it's a great boot within its range of application (and then some), and offers great performance for an 800g boot. But I want to make clear that this is not something that can handle all my backcountry needs, unlike what Jonathan S. said in his review. I will reserve it for trips where I expect consistent snow or where the light weight and efficiency outweigh the limited skiing performance -- as the designers no doubt intended. Overall: A streamlined yet effective shell plus a beautifully crafted liner adds up to Five Stars for great skiing performance at minimal weight. Background on product familiarity: I’ve used the old white version starting with the 2012-13 season -- although mine was actually the 2011-12 generation -- now with almost 781,000’ earned vertical plus some lift-served. Then the new black version from the 2014-15 season, now with over 83,000’ vertical. Setups have ranged from race skis up to a 97mm waist (Dynafit Denali). First, the first impressions out of the box: An expertly stripped-down evolution (hence the name?) of the original DyNA boot (which also spawned the Dynafit TLT5/6 design): every conceivably superfluous element has been stripped out from the shell while still preserving an amazing amount of skiing performance. The shell’s interior length is geared toward the greater of my 25.5/26.0 boots, as I can just barely accommodate (sort of) the toes of my 26.5cm foot, which is therefore only slightly shorter than the 279 bsl. As compared to a 26.0/26.5 TLT5/6 with a 287mm bsl, the interior length feels not quite the full 5mm shorter as would be implied by the stated size differential. The liner for the original white version was essentially a more minimal version of the already minimal TLT5 Performance TF liner. The liner for the black version though is something else entirely: I count about 16 distinct parts per liner. The liner is neither tongued nor overlap yet instead relies on a slim velcro flap closure off on the side. Entry though is still difficult (at least for my foot) since the opening in the liner doesn’t extend down quite far enough. But the back of the liner has a pull tab attached beneath the extensive flex zone. As with any skimo race boot, the fit modification potential is limited. However, a bit of excess foam (relatively speaking) was able to be removed from the top of the liner toe box, thereby providing my big toes with a few critical extra mm. I haven’t bothered heat molding the liner, both because the difficult entry could cause problems when heated and because I doubt its thin profile allows for much benefit from molding. The Grilamid nylon lower shell though has a good record for punching/stretching in the TLT5/6 boots. The partial-carbon upper cuff design is shared with the TLT5/6 Performance, with the same swappable plate for adjusting the forward lean. (EVO and TLT5 boots before the 2013 season lacked the swappable plate, yet can be easily retrofitted with the new part.) But no optional outer tongue, no plastic fixed inner tongue, and no power strap. The cuff provides complete protection from the elements in back, yet leaves a large gap in front. The lower shell has a fabric cover, but when the lower buckle is tightened up for a slim foot like mine, the fabric tends to sag open a bit, acting as a scoop. Plan either on wearing a race suit with an integrated gaiter, tucking the edge of your pant legs under the buckles, or bringing some of the snowpack along with you (although at least the liner is sealed up well down there, even if the shell doesn’t cover up the liner). Second impressions, in use: In walk/tour mode, the upper cuff pretty much just disappears. If you are used to a boot with an exceptional range of resistance-free movement like the Dynafit TLT5/6, the EVO will still shock you, even just from the elimination of the TLT5/6 fixed inner plastic tongue. Throw the side lever (which sometimes requires a second of fiddling to engage), and you’re in for another shock: rearward and lateral support are both outstanding, identical to the TLT5/6 Performance. Forward stiffness is also good if you set up the cord very tightly (for which you need to retie the slippery cord with a double fisherman). Obviously this isn’t the boot for high-speed lift-served skiing on cut-up chowder, but I don’t need anything more for backcountry skiing, at least on up to a 97mm waist width (Dynafit Denali). The cord on the upper cuff is attached to a very long velcro strap with a consequently wide range of adjustability. On the old white version, the lower shell buckle had two micro positions on the lever and two macro positions on the medial side. The new black version retains the two micro positions on the buckle lever but the medial side has a continuously adjustable velcro strap for both macro adjustments and fine tuning. The fit seems a bit more generous than the notoriously slim TLT5, although hard for me to tell for sure, since I had to go from a very thin sock to an essentially negligibly thin sock to buy a bit more room for my toes. The liner stays with the foot very well when striding, and the lack of overlap squish in front provides more responsiveness for skiing. As for warmth, our February 2015 was bitterly cold, and the EVO has very little wiggle room for my big toes, whose tips didn’t regain full sensation until well into the spring. However, my feet were otherwise okay, so I suspect the lack of wiggle room was largely to blame. Third impressions, for long-term durability: The rivets/pivots connecting the upper and lower shells prior to the 2012-13 generation notoriously loosened up over time, requiring repressing after a few hundred thousand vertical. 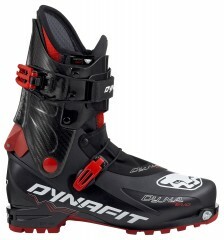 For the 2013 season, Dynafit added a sort of spacer (“gusset”?) to address this issue, which continues onto the new black version. However, a partner with this version eventually experienced loosening. But the repressing by Dynafit is free (with free return shipping from Boulder), and even my old white boots are only slightly loose now after just one repressing partway through their extensive use. The cord on the upper cuff will eventually snap after a few hundred or so transitions, but the fraying warning signs are obvious, plus back-up replacement cord is trivially light to carry and easy to retie. The lower buckle is fairly low profile, although also all plastic. The upper buckle protrudes significantly when open, yet after over two million vertical cumulatively on four pairs of Dynafit boots with the same design, no casualties. But for your next Whereveristan mountaineering expedition bring along McMaster replacement parts #s 90596A005, 91785A092, 96659A101 in case the buckle’s attachment rivets are damaged. Even if the upper buckle suffers irreparable damage, ski mode can be improvised by connecting the two cuff parts with a simple screw rivet (another trivially light addition to your repair kit) and by tightening up the cuff with a Voile strap (which of course you already have, emblazoned with the Skimo Co logo). Rubber outersole durability was a major drawback on the old white version, or at least on the original model year, or at least with some batches. But after about an hour of some crunchy rock scrambling, I’m happy to report that although I see some signs of wear, within the acceptable range. Just be careful with the extremely slender fixed loop at the end of the lower buckle’s velcro strap, since I managed to fray it when rubbed up against the buckle mount upon closure (although trivially easy to swap in the replacement). And if you need to apply any significant force to the liner pull strap upon entry, then before it starts to tear apart the liner, have a tailor apply a large leather patch around its attachment point, thereby distributing its force better (and also in the process patching up the tear you created if didn’t do this beforehand). This boot is just perfect, I have been using so much, they hold pretty well going up and down, the liner is also one of the best I have ever had in a boot.